Don’t cast your life away! That’s the potentially life-saving message from electricity bosses after an engineer was called to Pittington, County Durham, to remove fishing line from live high voltage power lines. A local resident told the engineer that he had seen someone practising casting close to power lines which cross a grassed area close to Coalford Lane. 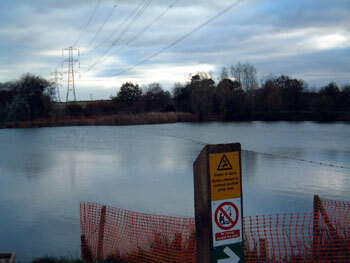 Head of safety for CE Electric UK, Paul Norton, said: “Fortunately, on this occasion, nobody was hurt but the consequences could have been a lot more severe – 11,000 volts of electricity run through these power lines and you do not need to touch a power line to be hurt: electricity can jump gaps and could easily have travelled down the fishing rod. Anglers are warned to stay well away from power lines when casting and to dismantle their fishing rods or poles when moving from one place to another. If you require any further safety advice, please call 0800 668877. The Electricity Networks Association (ENA) produces a safety leaflet for anglers. It can be downloaded at www.energynetworks.org/angling.